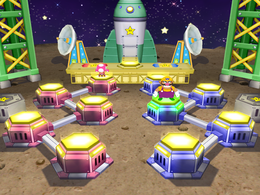 T Minus Five is a Duel minigame in Mario Party 6. In the introduction, it shows the players being teleported to the first space. The whole point of the game is for each player to beat the other one. Each player must try to ground-pound by pressing → when the space the player is standing on is green. If the player successfully ground-pounds on the green space, the player is teleported to the next space. Each time a player moves to a new space, the green light moves faster. There is a total of five spaces in all. If the player accidentally ground-pounds on a yellow space, the player is electrified momentarily. The first player to reach the final space wins. Rules – "Ground-pound at the moment the panel beneath you flashes to warp to the next panel. Whoever reaches the goal first wins!" Advice – "The flash will be quicker each time you warp. Mistakes will cost you precious time!" This page was last edited on March 3, 2019, at 01:05.